Dr Jose H Santos obtained his PhD in Chemistry from La Trobe University, Australia, in 1996 under the supervision of Professor Alan Bond. After serving as an Assistant Professor at the University of the Philippines, he worked as a postdoctoral scientist at Dublin City University and AIST Japan where he nurtured and developed his research interest in electroanalytical chemistry. He joined UBD in 2004 as a Senior Lecturer and is currently an Associate Professor, actively involved in the development of analytical methods that are low cost and environmentally friendly. He is also a Chartered Scientist and a Chartered Chemist member of the Royal Society of Chemistry in the UK. His current research involves fabrication of electrochemical sensors for detection and analysis of various substances in foods and beverages as well as in the environment. These sensors are not only environment friendly but are also low cost and easy to use. (1)	Food Biosensors Based on Molecularly Imprinted Polymers. 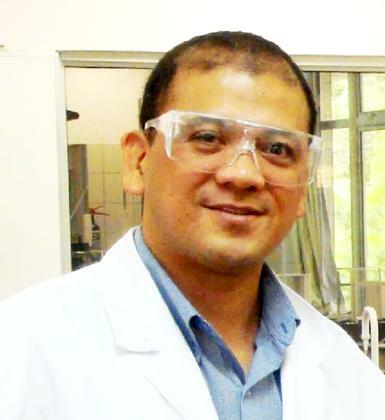 Kisan Koirala, Jose H. Santos, Fortunato B. Sevilla III (2016), Book chapter in Food Biosensors; Royal Society of Chemistry (RSC); ISBN 978–1–78262–361–8. (2)	Chemically modified carbon paste electrode for the detection of lead, cadmium and zinc ions (2016), K Koirala, JH Santos, AL Tan, MA Ali, AH Mirza, Sensor Review, 36 (4): 339-346. (3)	Adsorption of methylene blue from aqueous solution using untreated and treated (Metroxylon spp.) waste adsorbent: equilibrium and kinetics studies. Jeminat O. Amode, Jose H. Santos, Zahangir Md. Alam, Aminul H. Mirza, Chan C. Mei (2016), International Journal of Industrial Chemistry, 7(3): 333-345 [DOI: 10.1007/s40090-016-0085-9]. (5)	Biomimetic potentiometric sensor for chlorogenic acid based on electrosynthesized polypyrrole. Kisan Koirala, Fortunato B. Sevilla III, Jose H. Santos (2016), Sensors and Actuators B: Chemical, 222: 391-396. (6)	Determination of Chromium and Manganese in Steel Using Digital Photometry of Solutions. J Vedad, J Solivas, J Santos and E del Rosario (2015), Philippine Journal of Science, 144 (2): 117-127. (7)	Meat Species Identification using DNA-Redox Electrostatic Interactions and Non-specific Adsorption on Graphene Biochips. Sharmili Roy, Ibrahim Abd Rahman, Jose Hernandez Santos and Minhaz Uddin Ahmed (2015), Food Control, 61: 70-78. (1) Correlations between gastropod shell dissolution and water chemical properties in a tropical estuary. 2008. DJ Marshall, JH Santos, KMY Leung, WH Chak, Marine Environmental Research 66 (4), 422-429. (2) Adsorption behavior of cytochrome c, myoglobin and hemoglobin in a quartz surface probed using slab optical waveguide (SOWG) spectroscopy. 2003. JH Santos, N Matsuda, Z Qi, T Yoshida, A Takatsu, Analytical sciences 19 (2), 199-204. (3) Preparation of microelectrodes: comparison of polishing procedures by statistical analysis of voltammetric data. 1996. TJ Cardwell, J Mocak, JH Santos, AM Bond, Analyst 121 (3), 357-362. (4) Spectroelectrochemical studies on surface immobilized cytochrome c on ITO electrode by slab optical waveguide spectroscopy. 2003. N Matsuda, JH Santos, A Takatsu, K Kato, Thin Solid Films 438, 403-406. (5) Experimental evidence of the reversibility of the first stage of protein adsorption at a hydrophobic quartz surface near the isoelectric point. 2003. JH Santos, N Matsuda, Z Qi, T Yoshida, A Takatsu, K Kato, Surface and interface analysis 35 (5), 432-436. (6) Prism-coupled multimode waveguide refractometer. 2002. ZM Qi, N Matsuda, JH Santos, A Takatsu, K Kato, Optics letters 27 (9), 689-691.